What is the length of the cable between the panel and the light? Approximately 5m of cable between the light and solar panel. I'm guessing it will be OK to mount the light fitting inside the shed with the solar panel on the outside, it will then illuminate when I enter the shed and set off the motion sensor? Yes. It is bright at 550 lumens so depends on the size of the shed, you could always point the lights up or have a look at our shed lighting range. Sadly this is a security light only. Please take a look at our wall lights category. Can you limit the detection range to 10 metres or less. We don't want it to switch on every time someone walks by. You can not adjust the sensitivity of the pir but you can change the angle pir to reduce the distance by pointing to down. No, the battery is not removable. If the light gets low on charge you could simply switch it off for a few days to charge up but as this is a motion activated light you shouldn't need to unless the panel is in a poor location. Presumably it comes with the battery pack included and if so what would be the life expectancy be given average use? What sort of range does it cover? Thanks in anticipation! Yes, the light comes with the battery. All our lights come with a 12-month warranty. We'd suggest 3-5yrs but most last a lot longer. I have many 7yr+ old lights still working without issues. I have another PIR light from you which has an on/off switch. Does the Twin Solar PIR light also come with an on/off switch built in? The switch is on the base of the light head. It depends on how much dedication you require. The motion sensor offers 120 degrees detection angle at a range of up to 10m can be rotated horizontally through 180 degrees. If 120 degrees is not enough then you could consider two lights. Yes, these are designed to work well throughout winter. Currently, we don't sell an extension cable for this product. I would like to install a light approx. 6m above a path. Would this light be sufficiently powerful to light up the path? The light will be fine to do this however you may find the PIR doesn't detect you from far enough away. You'd be better off installing the light no higher than 4m if possible - please bear in mind you get 5m of cable with the solar panel so that should give plenty of scope to get the panel in a good location. 2 questions, first, is it possible to add a second light to the solar panel, second, are these a fixed battery or a removable battery which can be changed when battery has worn out. The size of the solar panel and the output of the lights only allows for one light. Even with the fact, it's a motion sensor light connecting two lights would either be very dim or not trigger many times. We do sell GEO kits which you can build and customise with panels, lights, and PIRs. How long is the included cable which connects the solar panel output to the light? In the User Guide it says "Please ensure that there are no nearby light sources hitting the solar panel or PIR sensor after dark." Would it be a problem if a nearby street light shines on the panel but not on the PIR? If so, why is that? Thanks. A street light shining on the solar panel could trick the light into thinking it's still daylight, therefore stopping the light from activating. This is rare and there are adjustable dials to compensate for this. Can you buy extension cables to the solar panel? I can see that there is an extension cable for the EVO products, is this compatible or do I need something else? We don't have an off the shelf extension cable for this however you could add a two core cable to it however this would invalidate the warranty I'm afraid. The Shield has to be mounted on a flat surface so you won't be able to install it as you describe. The Shield has exceptional waterproofing, to date we've had no issues at all with water ingress. All of the dimensions for the product and the solar panel can be found within the product image gallery and there's 5m of cable with the panel. Would it be possible to wire up this unit to an outdoor switch so it can be used like a normal light rather than having to use it with the PIR. Can the PIR be switched off?. I do not want any auto on/off lighting arrangements just a normal switch system, thanks. I cannot seem to find a light that does this. The Shield can only be used as a PIR light. The Evo SMD RC can be operated via the remote to switch on and off as required. Hello! I need to extend the cable of the solar panel, do you have any tech information about Amps/Voltage or the correct size of cable I need please over 10m? Thanks! There is no picture of the solar panel with this product. Is it supplied and does it come with a mounting plate setting the panel at the optimum angle ? We've added a picture of the panel now, It's mounted with a U bracket so can be angled up and down as required. We haven't had any issues reported to us with corrosion however I've heard that WD40 can provide a good coating or alternatively using clear silicone over where the plug from the panel enters the underside of the light. You can install the light at any height you like, most people go for something around 2 - 3m It's worth having a think about the solar panel position, with this higher is usually better as it will avoid the shadows more. Hello, Please can you provide me with some more specifications for this fitting? In particular the battery capacity and the PV spec. Thank you.. The Shield has 2 x Li-Ion 3.7v 2000mAh batteries and a 2.5W solar panel. At night do the lights stay illuminated all the time? Or do they only come on when motion is detected? I currently have a different brand and lights stay on all night and give a brighter light when motion is detected which is not what I was looking for. All our security lights will only turn on when motion is detected. Lights that remain on dimly all the time tend, in the longer nights, to run out of energy and so don't operate when the light is needed. Is the solar panel independent of the lighting unit? The solar panel is independent and has approximately 5m of cable between the light and panel. 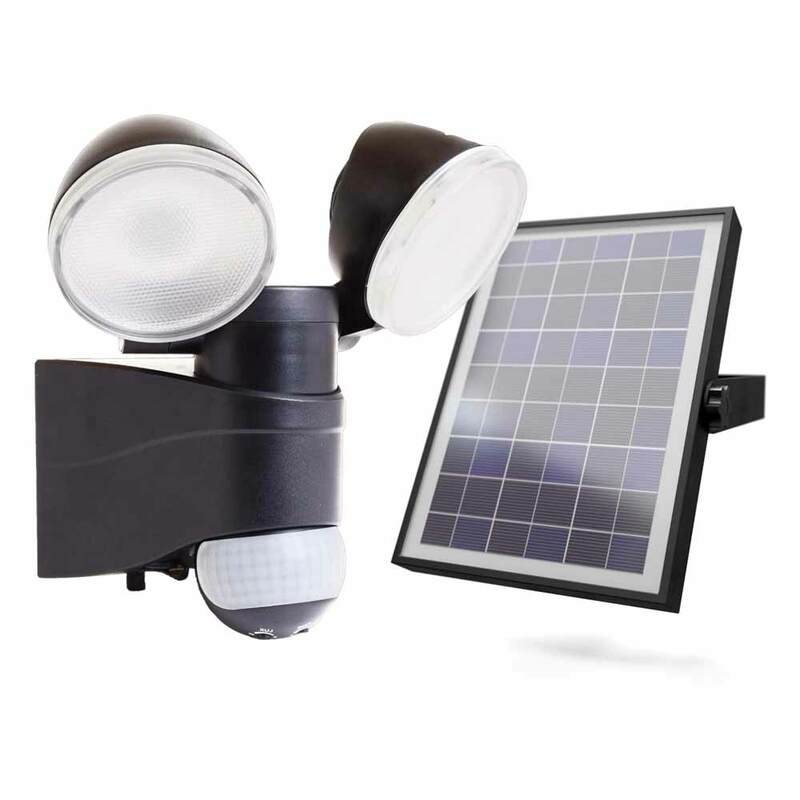 Got A Question about the Shield Twin Solar PIR Light?